The Gulf Coast Veterinary Specialists “Harvey Story” is similar to many stories in Houston. Our hospital flooded early Sunday, August 27, 2017, necessitating an emergency evacuation of staff and patients. Despite rising flood waters and dangerous conditions, the employees on duty were absolutely heroic in their efficiency, professionalism, and bravery as they evacuated the hospital and drove more than twenty patients to safety. Unfortunately, our main GCVS location at 1111 West Loop South sustained significant damage from the water, which rose past the ceiling on our two main floors in a matter of minutes. This 54,000 square foot building backed up to Buffalo Bayou and was a multi-floor concept which housed 13 specialty and emergency services and employed 239 full-time employees. As the record rainfall continued, however, the heart of the GCVS story began to unfold. Our staff members rallied around other Competitors set aside differences and opened their doors wide to our patients, staff, and doctors. GCVS doctors and technicians showed up at shelters where hundreds of displaced pets were in need of medical care and identification. Donations for GCVS employees who lost their homes poured in from our family of hospitals around the country, and a make-shift donation center was set up in the garage of one of our medical directors. And without a second thought, Compassion-First Pet Hospitals, owner of GCVS, put their namesake of compassion at the forefront of their efforts. Immediately, Compassion-First committed to paying the wages and benefits of every single employee, whether or not they were able to work. The GCVS story is also one of perseverance. With the loss of our main hospital location, the GCVS team immediately rallied the staff and developed actions plans to address the needs of area pets. This new plan had an immediate relocation of the emergency and critical care services to our other Houston hospital, which was previously dedicated to neurology and neurosurgery. Additional specialty services were then layered into this location, while in parallel, partnerships were formed with 9 local hospitals who reached out to offer space and resources to our displaced veterinary teams. 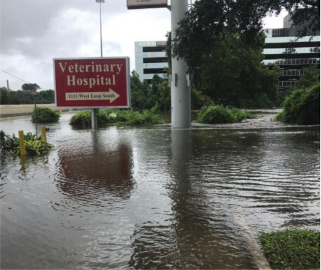 While these circumstances are temporary, the incredible generosity of these hospitals is a testament to the remarkable spirit of the Houston veterinary community, and for that, we are forever grateful. For us, GCVS is actually not a building at all–it’s a family. And the GCVS story is more than rebuilding after loss. It’s a commitment to the GCVS employees and the people and pets of Houston. It’s business colleagues and competitors alike coming together to ensure pets all over the city were cared for. And it’s the determination of the amazing professionals at our hospital to not only ensure the safety of their own families, but to get out in cars, boats, and canoes to help wherever they could, all over the city, and work with whatever was available to continue to serve Houston pets in need. Thank you to the Houston veterinary community, our supporters, and most importantly, our incredible staff and doctors. To learn more about the status of GCVS, where our different departments are currently located, and how you can schedule an appointment, please visit our website at www.gcvs.com or call 713-693-1111.